LEDs are great. But with any project there comes a point where flashing is simply not enough. For these cases an RGB (Red, Green, BLue) LED is the answer. With an RGB LED you’ll be able to produce any colour glow your heart desires. At first using an RGB LED seems quite complex, but it quite quickly becomes clear that its no more difficult than controlling one of their single colour counter parts. What follows is a quick guide to get you started controlling an RGB LED first with wires then with an Arduino microcontroller. If you’d like to jump ahead to any part here’s your chance. Only a few parts are required. A common anode RGB LED is nothing more complicated than three one colour LEDs (one red, one green, and one blue) housed in a single package. A common anode RGB LED is the most popular type. It is most commonly found in either a 5mm bulb size or as a 5mm pirahna form factor. Most LEDs are designed to work with a voltage between 1.5v and 3v. As most microcontrollers (including the Arduino) operate on 5 volts a current limiting resistor is required. Consult your LEDs datasheet for maximum ratings but we like to use 270 ohm resistors. This limits the current to ~20mA, well within most LEDs and microcontroller ratings. Before we connect our RGB LED to our Arduino it’s a good idea to give it a test. Consult your RGB LEDs datasheet for its pin-out or below are the two most common RGB LED form factors and pin-outs. 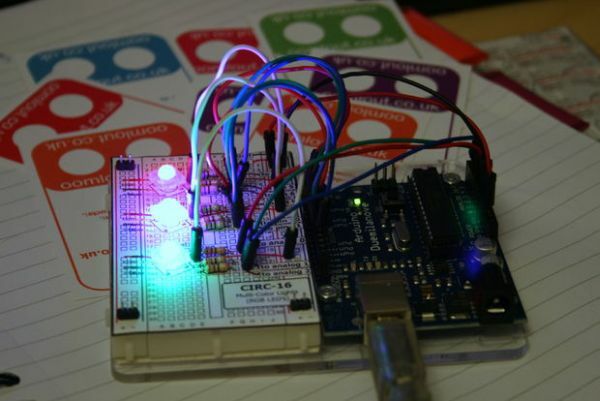 Time to move on to controlling your RGB LEDs with an Arduino. Wire up the circuit below. There are two ways to do this. For the more advanced consult the schematic below. It is possible to control an RGB LED digitally. This requires 3 digital pins for each LED and allows for 7 colours to be displayed (Red, Green, Blue, Yellow, Cyan, Magenta, White). Copy the code below and paste it into a an empty Arduino sketch. Compile and upload the sketch to your Arduino board. Enjoy as your three LEDs light up Red, Green, and Blue. To see how we control each LED look at the setColor() function. Next comment out (add //) to the three lines of example 1. 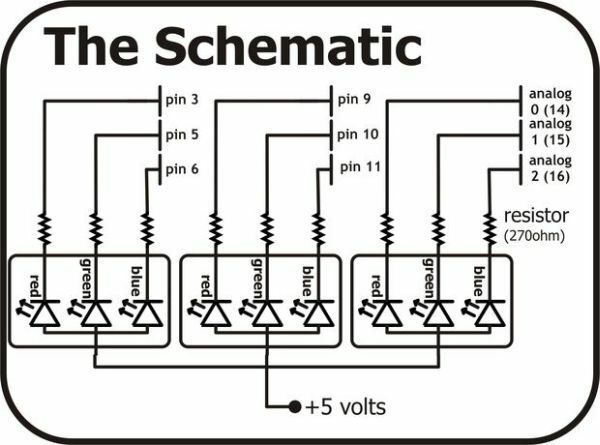 Upload this to your board and watch as your three LEDs change colour randomly. Play around with the code to see how it works and make your own fun color functions.